Hurricane Florence: Why They Stayed While Hurricane Florence advanced, and mandatory evacuation orders were issued, many chose to stay in their homes. 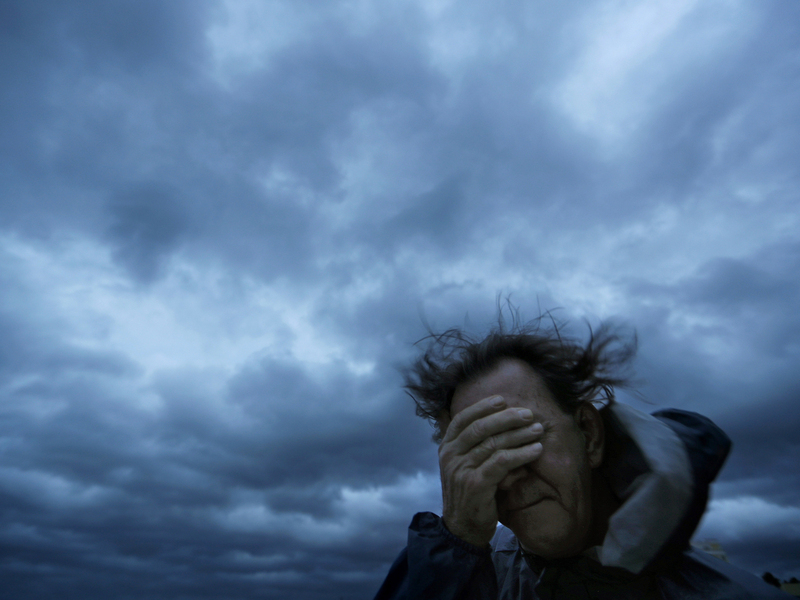 Russ Lewis covers his eyes from a gust of wind and a blast of sand as Hurricane Florence approaches Myrtle Beach, S.C. Even as mandatory evacuation orders were issued, many chose to stay. "I'm hunkered: I've got my chainsaw and other supplies. I boarded up the windows. I've got my generator. I've got food, and I haven't lost water," he said. "I just feel confident that I can handle whatever comes at me." This is his 16th hurricane. He stayed put for all of them. While thousands of others evacuated North and South Carolina in anticipation for Hurricane Florence, many did not. For some, like Wood, they're used to the storms. Prior to retirement, Wood worked for a electric utility company and was often required to stay behind for his job in order to conduct repairs. Now, even the initial forecast of a Category 4 storm didn't faze Wood. He said he would have stuck around regardless. This time, he stayed because he was worried about the trees closely surrounding his home, and wanted to try and save the house from as much structural damage as possible. As of Friday afternoon, only one tree had broken in half, but it didn't hit the house. Wood did say, however, Hurricane Florence was much different than the storms he experienced in the past. "It's so slow. Most hurricanes are one day, or they come overnight and then they're done," he said. "This one ... it's taking its sweet time. If it would just hurry up and get out, we'd be done with it." Wood lost power on Thursday night, but said he has managed to keep up good spirits thanks to the support of his neighbors. "My neighbor across the street is cooking dinners," he said. "I go there to eat with others and it's like a big party." Others aren't faring as well. Marilynn Cullison stayed at her house in Swansboro, about an hour south of New Bern, N.C., where officials have already rescued scores of people from the rising floodwaters. 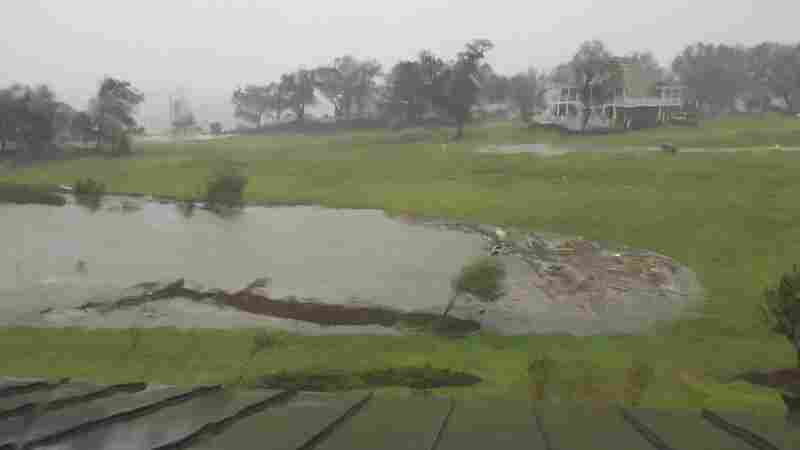 Surrounded by rising storm surge waves, Cullison's home has become a refuge not just for herself and her husband, but also for two dogs, a cat, and five of their neighbors. Marilynn Cullison stayed at her house in Swansboro, about an hour south of New Bern, N.C. This is a view of her property after Hurricane Florence came through. "We gained two more overnight because their roof started to leak and there was water in their homes," she last week. Her home has a metal, rather than shingled, roof, a generator, and sits on property 24 feet above sea level, all factors which made Cullison feel safe in her decision to sit tight. True to her predictions, Cullison said her house is holding up well, and survived the night just fine. But the night wasn't easy for those inside of the house. "Our night was rough because the gusts were very strong," she said. "It kind of vibrates the windows and shakes the house." She described the noise as a rushing sound, not unlike that of a train, accompanied by the noise of rain hitting the roof or windows, and occasionally, a thump. If you decide to stay in the storm, you have to be able to quell your own anxiety. Maryilynn Cullison, resident, Swansboro, N.C.
"You'll hear something hit the side of the house and you're like, what was that?" she said. "We found out the next day that it was shingles flying off from the next house. But it's an unsettling feeling. If you decide to stay in the storm, you have to be able to quell your own anxiety." The main reason Cullison gave for remaining in Swansboro were her concerns about her ability to return to her home, based off prior experience after Hurricane Floyd hit North Carolina in 1999. After Floyd, she said many who had evacuated couldn't return for weeks. "The next time we have a 2 or 3 storm, I might re-evaluate staying, but I'm feeling okay about our decision," she said. Waiting out the storm is less of an option and more of a necessity for other residents. Kirsten Crook, of Boiling Spring Lakes, N.C., originally planned to stick around for Hurricane Florence and help her boyfriend take care of their animals. But, due to an injury she incurred before the storm, she was forced to leave to ensure that she could receive proper medical care. Her boyfriend stayed behind in the nearby town of Leland, directly in the path of the storm, without cell or internet service. "He stayed because we have five horses, one donkey, dozens of chickens, dozens of pigs, and five dogs," Crook said. "Finding shelter for one dog or cat is hard enough but to find shelter for a lot of large animals is hard." Transporting those animals is another challenge. Crook explained that they had a horse trailer, but most horse trailers only fit three. "How do you only pick three of your horses to save?" She said. "You can't choose your favorites. They're like family members." With three dogs, six cats, and two horses in her family, Crook's friend, Carolyn Weinzapfel, faced a similar dilemma. Weinzapfel also stayed in Leland because she said finding a shelter for all her animals would have been too much of a hassle, and a financial risk. Miraculously, she still had cell service on Friday afternoon. "We talked about evacuating to Pinehurst," she said, referring to a town further inland. "But it would have been $40 a day for the horses, and if we couldn't get back in for weeks, it would have been expensive." Instead, she left the horses on a friend's property nearby and returned to her house to brace for what came next. Once the storm hit, she experienced some rain with heavy wind that tore the siding off of her house. She said she was lucky. Another house in her area used to be three stories, now, she said, it's one story. The hurricane took off the top two. "After that wind and rain, we were like, it's a good thing it wasn't a Category 4, or even a 3, because we don't think we would have survived. You can't survive if the house goes down." But, Weinzapfel and the three others in her home have been okay. They're bunkered in her basement, waiting for the storm to pass. The first thing she said she'll do when she can go outside again is check on her horses.